Amazon is having a limited Gold Box special offer for Computer Associates Internet Security Suite Plus 2008 for FREE after a $25 mail-in rebate. This special discount price is only good for a few hours today. To see the special price, be sure to check your "gold box" at Amazon. Once the discount is over, the software package will return to its regular price. 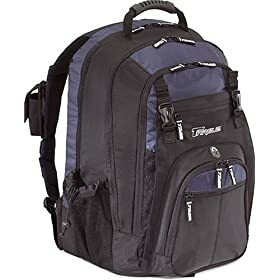 A short-time special offer at Amazon for $40 with free shipping is the Targus TXL617 17 XL Notebook Backpack. The regular price is $51! The notebook section is a separate compartment. Includes a "soft" organizational shelf and even a spot for your music player and even a little spot for your headphones. The bag weights 3.2 lbs and the shipping weight is 4lbs. The material is 840D Nylon and 420D Nylon Ripstop. Limited lifetime warranty! If you are a fan of Apple, then keep on reading! MacMall has a trio of hot specials for each of the three main Apple mobile computers! We start with the most popular one, the MacBook running up to 2.4 GHz, and starting at $975 in price. And if you don't object to rebates, you can get a free printer and free Parallels 3.0 after you submit and receive the rebates. And the last of the three is for the power users, the Mac Pro starting at $2125 and going as fast as 3.2GHz with a Quad-Core! Vroom! For today only, Friday September 12, 2008, Amazon is offering as a gold box deal the Kensington K33902us Bluetooth USB micro adapter for just $20. Free shipping if your total order is $25 or more, which you can easily make it so by adding a gift certificate or some mp3 or video (unbox) downloads. Going small? How about the Acer Aspire AOA110-1295 white small notebook, powered by the Intel Atom N270(1.60GHz) processor, with an 8.9" Wide SVGA display, 512MB (onboard) Memory, and an 8GB hard disk. Remember, this is a small laptop, don't expect this to behave like a desktop replacement! Also small, the ASUS Eee PC 900 can be yours for $360. It has a 8.9" Screen but with a built-in camera, 16GB SSD (solid state disk), comes in galaxy black, and comes with Windows XP Home preloaded. Affordable laptop? How about the Acer Aspire 5315-2826 Notebook going for $430 with free shipping at Buy.com. This however has an older processor, the Intel Celeron M 560 2.13GHz, along with 1gb memory, 15.4" WXGA display, 1GB, 80GB hard disk drive, CD-RW/DVD-ROM, and Windows Vista Home Basic. If you like this model or the specs that's fine, if not, there's plenty of dual-core more recent models for under $500, assuming you don't object to submitting rebates.